Condition: New Angel series Product name ANGEL Series BL-95 TOP Solid Spruce BACK / SIDE Rosewood Laminate NECK Mahogany FINGER BOARD Ebony BRIDGE Ebony Nut width (mm) 42 Scale (chord length) (mm) 645 Total length (mm) 1030 Body width (mm) 410 Note: The image is a sample. The color may be different. Asia, Canada, China, Mexico, Japan, Australia. Europe, United Kingdom, Germany, France, Russian Federation. We do not mark merchandise values below value or mark items as "gifts" - US and International government regulations prohibit such behavior. 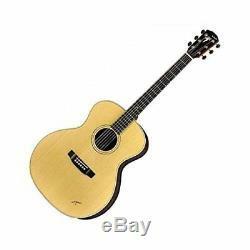 Yairi BL-95 Acoustic Guitar Folk Guitar kazuo yairi from japan sound" is in sale since Sunday, February 3, 2019. This item is in the category "Musical Instruments & Gear\Guitars & Basses\Acoustic Guitars". The seller is "fe-shop-japan" and is located in koriyama.